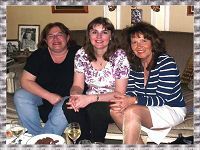 While I was preparing this page, dedicated to our dearest friend Juliette, I was thinking what can I tell our visitors which I have not told yet? How to captivate everyone and not repeating myself with my narrative? 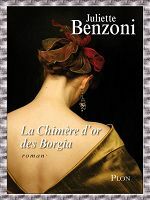 But then I said to myself: " Linda, surfers who land on this or Frédérique's page, are fans of the author Juliette Benzoni. They want to know news, facts and how the well-being is of the Queen of history books! 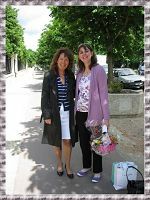 So without ado here are a few lovely memories of our newest meeting with our Juliette on Sunday 15 May 2011 at Saint-Mandé. 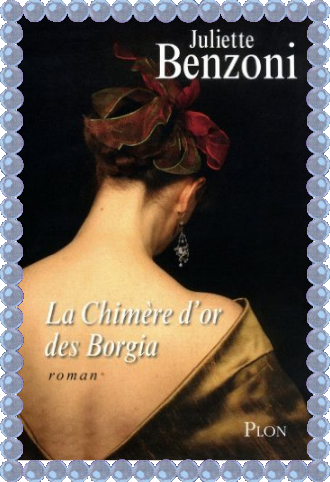 Between Juliette and "les filles des grands chemins" has grown a wonderful, profound and exceptional friendship. 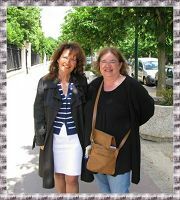 Shared also with Hélène - Danette - as we call her, the founder of the name "Les Benzonettes". With her sweet and enjoyable manner she complements us wonderfully, just like my daughter Claudia did on her visit. 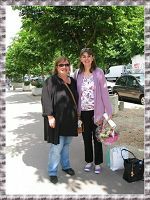 All three of us live in another city or in my case in another country (Switzerland), but when our dearest friend invites us to come and see her, we overjoyfully pack our suitcases and travel to Saint-Mandé, by train and car! Just as we did last Sunday. 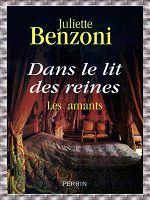 The Benzonettes meeting place in the afteroon was by the beautiful Park Bois de Vincennes in Saint-Mandé. 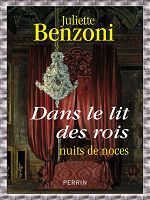 In front of Juliette Benzoni's house, we played our little game of who should ring the bell this time (see my other reports) ! In one accord we put our fingers to the bell waiting, that it would be opened for us. We were expected and the door swung open! A look left to see the roses, a look back to see that the beautiful tree in the garden had been truncated and we ran almost up the steps, hugging and kissing Anne, Juliette's daughter, caress quickly Oliver, our hairy friend and then enter the now well known living-room of Juliette. 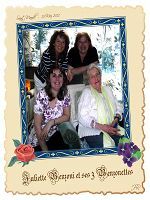 We found our "Queen" in good health and soon the room was filled with laughter and talking all together. We had found "home" We sipped with delight the cool champagne, enjoyed the fresh cherries and ate once again dessert from "LeNôtre" one of the best addresses in Paris. 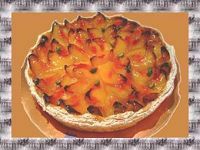 One just cannot resist a Tarte (cake) of apricot and pistache, dressed with pâtissière aux amandes! 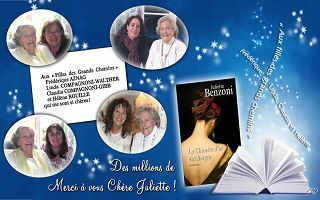 With immense joy we told Juliette about Facebook and that her faithful readers had begun to leave personal messages there for her! We had printed all of the comments out and delivered them to her. How can I describe the look on her face when we told her about all this? Let me only say so much dear visitors, this amazing woman who has written over 78 books (it would be 86 after 7.2. 2016 on the day of her passing away), was so moved by all the admiration and devotion she gets from her readers all over the world. She sends all of you, her deep and sincerest thank you for all the years you have read her books and still do! 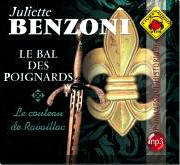 With had already on the day before decided to ask Juliette, if she would alow us to record a short message for our websites. To our great surprise, she agreed immediately to do that! Oops... it would take too long to explain what a sound-recorder Linda is, especially when you have some giggling girls in the background ☺ I know I am not "Dame Marion Sarraut" - but my 1...2...3... was almost professional..! I confess, it was one of those moments when you would like that time stands still! 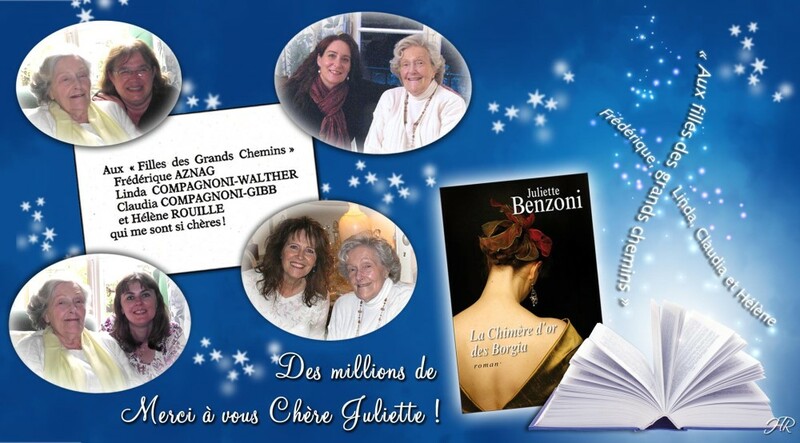 A chuckling Juliette, a Linda on her knees (with my short gown...)and three such dear friends as Anne, Hélène and Frédérique, supporting this incredible event fervently! 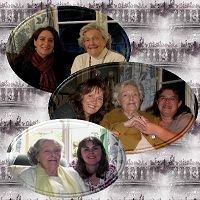 "Les Filles des Grands Chemins"
Reports of the meetings with Juliette whom we met at least five times a year 2009 - 2016.